Government policy was too dependent on intelligence in the run-up to war with Iraq, the former head of MI6 has said. Speaking in London, Sir Richard Dearlove said when the government made its case in Parliament, too much emphasis was put on intelligence. In reality, there were many other factors contributing to policy decisions, he said. This turned out to have highly undesirable consequences for the intelligence community, he added. Sir Richard, the head of the intelligence service from 1999 until 2004, made the remarks at the London School of Economics. In his lecture on intelligence and the media, he said the government felt using intelligence as the primary justification for its actions when presenting its case in Parliament was the best chance of winning over its opponents. But he went on to say the conjunction of events relating to Iraq was highly unusual and unlikely to apply to issues such as Iran's nuclear programme. 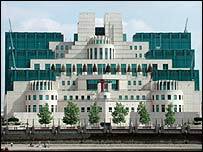 In 2003, there were reports of a rift between the government and Sir Richard over intelligence, but they were denied by Tony Blair's government at the time. There were also suggestions Mr Dearlove stood down from the post known as "C" in 2004 over the matter. But the Foreign Office insisted his retirement was in no way connected to events relating to Iraq.